We were a group of 9 BRC riders, enjoying the setting sun over Pangong tso, sitting outside the tents, thinking how amazing it was that we were here in the month of June when the snow was still fresh. 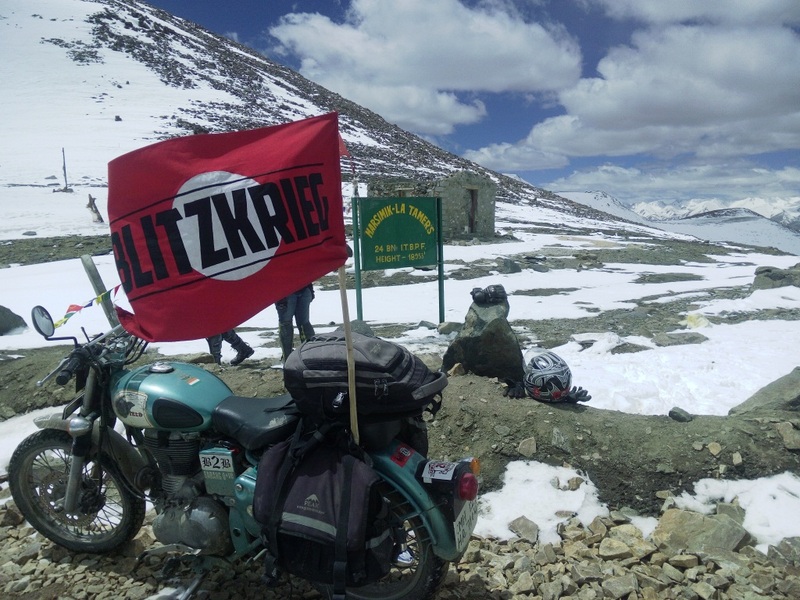 The next day was a big day for all of us – we were going to the Marsimik-la, the highest motorable pass at 18,953 feet. 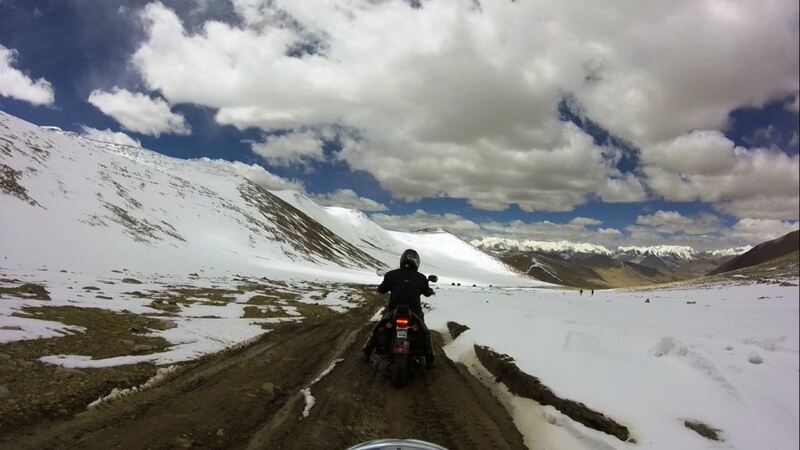 We were really lucky to get the permission to ride to Marsimik-la, as there are literally no roads to reach there. We even saw the Army denying permissions for others, but we got it somehow. The plans to tackle the upcoming roads were on in full swing. Everyone pitched in with their ideas about what time we must leave and how we will handle the roads. We were motivating each other, and in our hearts we knew that the task will not be easy. Few villagers overheard our conversation and yelled at us, “Are you guys crazy, you cannot go there!!! We know how the roads are, we go there for cattle grazing and it’s not something that you want to attempt. If you get stuck, then after a certain time, even army trucks won’t be able to go there to help you.” To tell you the truth, we were scared, however keeping the spirits up, we motivated each other and continued with our hot tea and Maggie noodles. Next morning, everyone woke to at exactly 5.00 am and started to get ready. I had not been able to sleep the whole night due to excitement, I wonder who did! The tent owners were kind enough to prepare little breakfast and tea for us. Throttling with full enthusiasm, riding along the Pangong lake, we reached the Army Gate for permissions, they warned us, “You guys need to be back by 11.00 am. After that the weather gets really bad. Our Army trucks will be back around 11.30 am and till evening no more trucks will go to the top. So if you get stuck, we won’t be able to help you guys till evening. And one more thing, 1.5 kms before Marsimik-la milestone, you will have to park the bikes and trek, as there is literally no road to the top.” Giving them the thumbs up sign, we continued. The first few kilo metres of the twisting path was filled with gravel, small stones, and dust, which caused the rear tire of the bike to move almost horizontally. Keeping the handle straight with tight wrists and swift arms the front tyre grabbed the gravel as we move ahead. And then suddenly road stopped! Literally!! I could see two paths, one completely covered in snow, with no way of knowing how deep the snow is, and the other covered with snow but where at least some stones were visible at the corner of road. We decided to take the second road, considering it to be the safer one of the two. The hard black ice beneath the layer of soft snow made it difficult to ride. One miscalculated twist of throttle or thrust of power could push you over the edge. A few riders stopped and decided to go back to Pangong tso. We were 6 riders now thumping to the top. The lead rider stopped after every 10 meters to check the depth of the snow and then gave us the signal to ride again. After covering a few meters, slicing through the snow, suddenly the lead’s bullet’s rear tire sank 4 ft under. 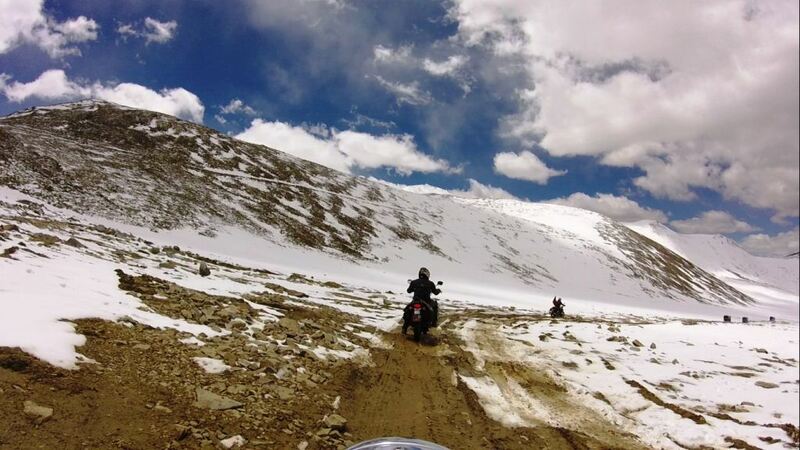 We then realized that as we go on the top, the soft snow bed was waiting for us where it’s impossible for us to ride. Lead gathered everyone and asked us to take a call. Few riders decided to park bullets and trek till the top, but I didn’t want to give up. I could see the milestone just 1km away The adrenaline rush in me wanted to take my bullet till the milestone and achieve what no one expected us to do. I told myself, “If there is no way, I will look for a way. If there is no path I will make one.” And on that path, I found like minded people. After few minutes, while we were still discussing how we can ride till the top, far away from some different route, we saw an Army truck coming down from the top. Everyone shouted that we still have some hopes remaining, but we can also see the truck’s tires, with such huge torque, finding it difficult to go through the slush. We were now 5 riders who rode back to the base point and saw the truck exiting from the first route which we didn’t take. The good part was that the tires of the truck had made a deep cut in the snow through which we could now ride via the first route. But the bad part was, it was worse than riding in snow (but at-least we could still ride). The truck cut the soft ice and had made a patch of slush where our 190 kg bullets needed to keep up the same momentum and not let themselves roll in mud and get stuck. It was a combination of slippery mud and slush. Riding towards the top with just 45 degree inclination on such a path exhausted us; the bullets were just not ready to move against the gravity. We were drained out. To cover 10 meters, we took 10 mins. With temperatures well below zero and low oxygen levels, we felt breathless, but I knew that nothing happened, unless you made it happen. That 1 km ride to the top of the Marsimik-la took us 3 hours. The first thing that I did after reaching at the top was to scream as loud as I could and then I kiss my bullet for giving me such a memorable experience to cherish for a lifetime. I live for the journey and not the destination, and my journey is on an engine with two wheels. If you want to control one, you have to be conditioned. I like living on the edge and I like pushing my boundaries. I have discovered what is possible by attempting what is impossible. I like doing things the hard way, but it’s always been my way. I don't live by a routine or schedule; I like to trust my instincts and follow my nose. The result is that that I have a wealthy memory bank. Through my riding trips, I have gained a treasure trove of sceneries, nature’s blessings, experiences and memories of events which are worth a billion times than a fat bank balance. My Journey doesn’t end here, this year again I am going to make my way to Nepal over the places where even Google maps or any maps cannot find the route to those. New Memories are going to be added in my bank. Riding gave me all this and made me live my life as a Bullet Rider. Thanks Prasad, I am sure you and your bullet will have a lifetime experience and one awesome story cherish. Just make the ride happen anyhow and Sarang will make your journey a memorable one.